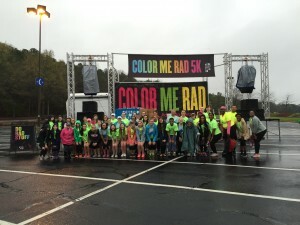 Ronald McDonald House Charities of Alabama is proud to have been a part of Birmingham’s Color Me Rad 5K. This annual event is always a Birmingham favorite. Like any major public event, many individuals are needed to make sure everything runs smoothly. 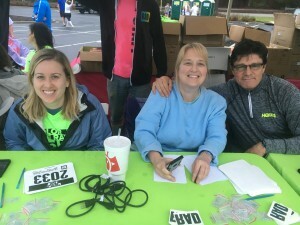 Color Me Rad allowed RMHCA to partner with the event — RMHCA volunteers manned various places on the course, the registration table and handled cleanup. In return, Color Me Rad donates to the House. The volunteers who love RMHCA never cease to amaze us. It is at events like this one where we see the true colors of our volunteers (no matter what color powder they might have been covered in by the end of the day!). They come from all over and are always willing to do whatever it takes! We had over 75 volunteers early on a Saturday morning supporting the House at the race!! Brenda, who volunteers for RMHCA often, told us why she loves to help out whenever she can, “Volunteering for the Ronald McDonald House is such a rewarding experience. 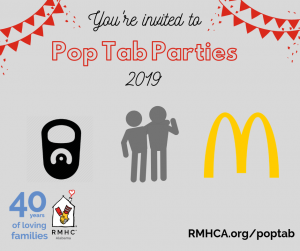 I started out cooking dinner with other co-workers once a month but now I have found the joy in donating my time to raise funds and awareness about how RMHCA helps families throughout the entire state of Alabama. I find that most people have no idea how the RMHCA serves our state. We are always looking for great volunteers like Brenda, if you are interested, fill out our volunteer application!